May you each take a moment (or several!!) to reflect on the magnitude of this accomplishment that EACH of you helped make possible. Rarely does an agency make such swift changes to an engrained program. 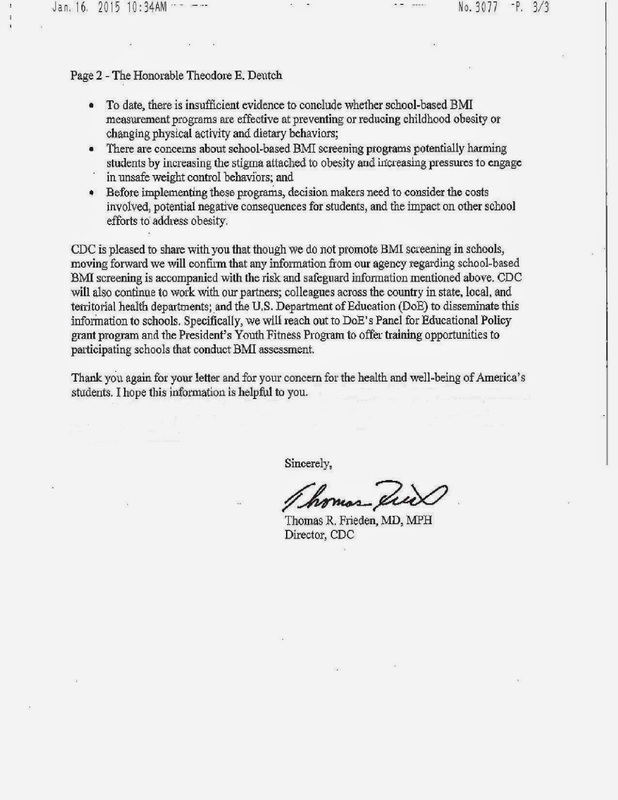 CDC did so because of the hard work of the Congressman and his staff, and because of EACH OF YOU who cared enough to sound off about the reasons why BMI screening and surveillance in schools is not a sound practice, and is in fact oftentimes very harmful. The results of our collective advocacy made a huge difference! Together, as a coalition, we did what EDC advocates have been doing so well together since 2000: We noticed a problem; we educated people about the problem; we shared personal stories to highlight the problem; we advocated for change using our power in numbers at EDC National Lobby Day/Virtual Lobby Day; and we respectfully dialogued with the appropriate people to seek out results that are viable and sustainable. As many of you know, eating disorder advocacy is not always easy and change is not always swift. 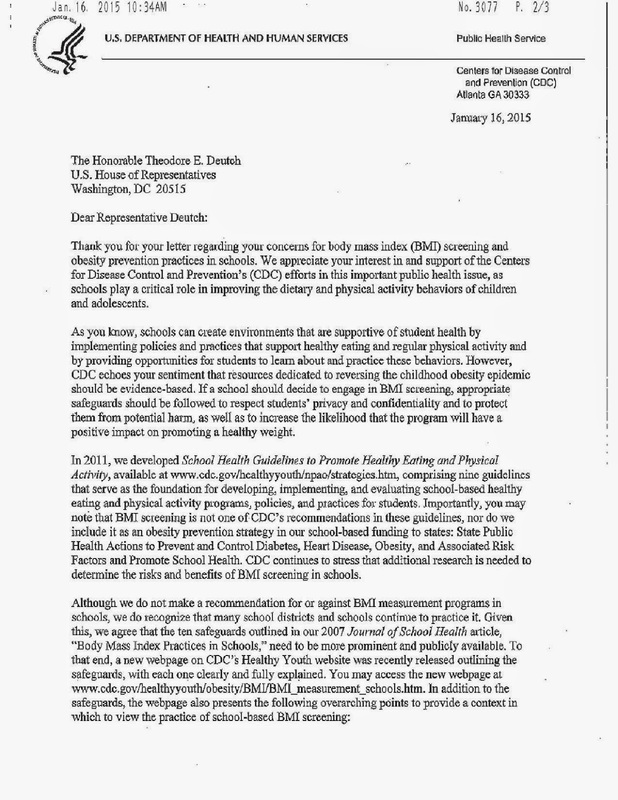 As the EDC celebrates 15 years of advocating on Capitol Hill (and beyond), I think that is something we can each attest to as we reminisce about various legislative efforts that we have worked together on over the years (Mental Health Parity, to name one). But I think what we can also each attest to is that when we work together, as a coalition of varied advocates that celebrates each voice and each person's spirit, our advocacy efforts make the hard work a downright a blessing and a pleasure! Creating and passing legislation is not for the faint of heart...which is one of the reasons I'm so grateful we are who we are: the EDC. You, the advocates of EDC who make the EDC a Coalition, are a collective of parents, non-profit organizations, treatment-providers, sufferers, survivors, loved ones left behind, siblings, family members, researchers, friends, industry-leaders, colleagues in the field of mental health, and more, who keep my heart alight with hope each day because you're each deeply committed, powerful, convicted, intelligent, unique and strong-of-heart. I KNOW that together we WILL continue to see the positive results of our advocacy --including I believe we will pass legislation to address the myriad of problems that currently pervade the lives of those impacted by eating disorders. We WILL work together to educate all medical professionals about eating disorder prevention, early intervention, symptoms and treatment protocols. We WILL work together to secure additional increases in research funding for those doing the super-amazing work that will undoubtedly help guide treatment protocols and prevention efforts --which will help save lives. We WILL work together to ensure that parity is enforced. We WILL work together to pass legislation that helps all those impacted by eating disorders receive access to benefits and treatment. And we WILL work together to ensure that NOT ONE MORE GREEN SHIRT is ever, ever necessary. Thank you to each of you who rose up to use your voice as an EDC advocate in 2014 and especially for using your time and voice to help with the Dear Colleague letter. I think back so fondly on our closing-circle at the end of October's National Lobby Day and I am reminded that we are not only a coalition, but we are a family. We are a family of advocates who will always be here to support each other and help keep our internal flames of hope burning (especially on days when it might grow a bit dim or fan out momentarily). We are a family who will forge forward together until we effect the necessary changes to prevent even one more day of suffering, and that forfends another senseless death to these insidious, but very treatable, disorders.